In a first for WipEout, SOny XDev & Clever Beans' fantastic remaster of WipEout HD/Fury & 2048 has taken the number one position in the UK charts. What's more remarkable is that not only is this the first time a WipEout release has hit the top spot, it's number one in the all formats chart – beating Tekken 7 into second place and outselling Codemasters' Dirt 4, which took third. Here at WipEoutZone we'd like to congratulate everyone involved in bringing WipEout back – WipEout: Omega Collection deserves every success and hopefully it'll lead to a fully fledged sequel. Okay, so back somwehere in the mists of time... February 2012 whilst I was at a conference in Oxford, to be exact... the server got hacked and the dude that did it planted lots of nefarious code everywhere. So due to the fact I couldn't really trust any of the code on the server I decided to delete all the files related to the old main site. That was supposed to be a temporary measure, but one thing led to another and that led to four and a half years. But hey! Here we are live again with more to come. If you've become a visitor here during the down time then you probably don't understand what the deal is. It's cool. It's like an old school fan site kind of deal with features and all that kind of thing. Anyway, you can't login or register for the main site yet as the admin side of things is taking a lot longer to clean up. So consider this a beta relaunch. 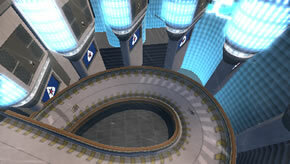 WipEoutZone is a fan community for the Anti-Gravity Racing game series, WipEout. On WipEoutZone you can compare record times with other WipEout fans from all over the world, enjoy a wealth of WipEout related content, and chat with the other pilots on the forum. Jason	"Star_Pilot17" Nunnery	(USA) and Liam	"Agent_Sandvich" Worswick	(United Kingdom) , the newest additions to the 2663 members here on the premier anti-gravity racing fan site.